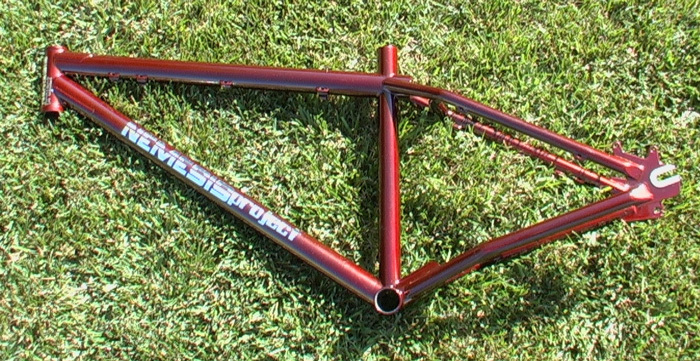 Thread: NEW Nemesis Project streetfighter frames .....pics!!! 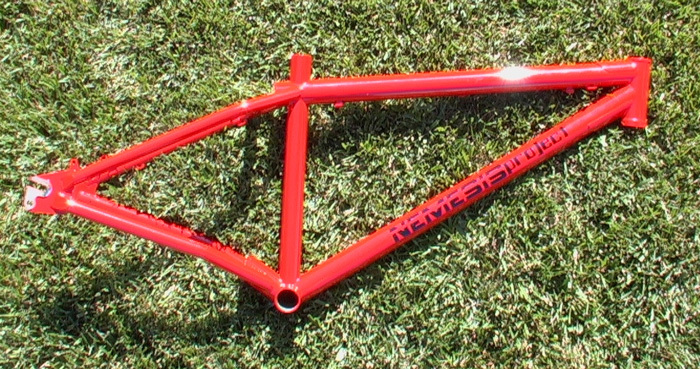 I had a few new Nemesis Project Streetfighter frames come back from paint today and wanted to show you guys the new colors and ask what you think ? ok red and rootbeer !! The rootbeer frame is going to Eric from Deity components !! A white frame with a white Deity crankset and bar/stem would have been awesome. Yes the white on white is going to be a sick combo , we should have a bike like that at our Interbike booth ! Good call on building that white devil for Interbike...I saw an Evil Imp with that build, and it was really nice looking; made me want that frame. ok. what am i missing here? horozontal drops, but no way to adjust the rear disc brake when moving the wheel? Disk and wheel question .....? Ok I thought this might come up , the drops have less that 1" of adjustment so with a 63mm rotor you still get maximum pad to rotor contact braking isn't effected . I have been running a setup like this for over 4 years now with no problems . or to allow for adjustment of wheelbase tire clearance and upper der pulley to cog engagement. Yes the Streetfighter frames are 24" specific ..... to create the best " freestyle mountain-bike " we feel 24" give the bike a better ride feel while making the bike more controllable for tricks like turndowns and x-ups and 360's. anyone have pics or info on Robichaux frames?